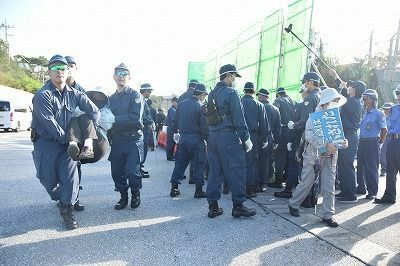 Prefectural riot police forcedly moving citizens who were staging a sit-in on November 22 at a little past 9 a.m. in front of the U.S military Camp Schwab gate in Henoko, Nago City. On November 22, the Okinawa Defense Bureau (ODB) continued with carrying in the materials over land needed for the new base construction related to the relocation of the U.S. military Futenma Air Station to Henoko, Nago City. Since resuming transportation of materials on November 16, there have been more than 100 construction vehicles every day carrying gravel into U.S. military Camp Schwab. Citizens began sit-in protests in front of the gate from early in the morning. They commented that the new base construction is an act that destroys Okinawa’s future, and raised their fists up criticizing the government for forcing through the new base construction. Citizens opposing the new base construction and criticizing the government for forcing through the construction on November 22 at a little past 9 a.m. in front of the U.S. military Camp Schwab gate in Henoko, Nago City. 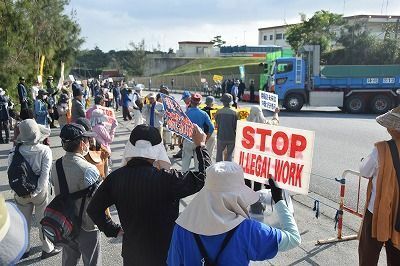 At 9 a.m. as heavy-duty trucks and concrete mixing trucks began to line up in front of the gate, the prefectural riot policemen forcedly moved the citizens. A total of 39 construction vehicles carried in materials past the gate.